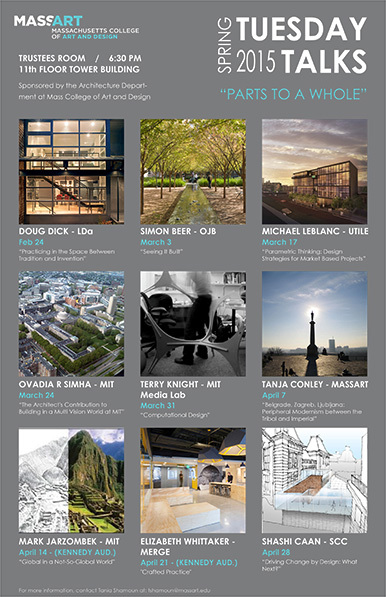 Utile Principal Michael LeBlanc spoke with students of the Massachusetts College of Art and Design as part of their Tuesday Talks lecture series this week on the topic of Parametric Thinking: Design Strategies for Market-Based Projects. His lecture focused on identifying the market-driven parameters and constraints inherent in profit driven projects and their successful conversion into meaningful design opportunities. These issues were analyzed through the careful evaluation of the Utile’s 248 Dorchester Avenue multifamily housing project which is currently in the early phases of design.